‘Fruit below the middle size, round, and flattened at both the extremities, about two inches deep, and two inches and a quarter in diameter. Eye small, with an obtuse closed calyx, placed in a very shallow basin. Stalk half an inch long, thick, inserted in a small round cavity. Skin greenish yellow, with a good deal of pale brown russet, and specks on the sunny side. Flesh melting, with a sugary high-flavoured juice. Ripe the beginning and middle of September.’ [George Lindley – Orchard Guide p.353/1831]. ‘Bergamotte d'É'té is of ancient and unknown origin. Le Lectier wrote of it in 1628 as cultivated under the name of Milan de la Beuverière.’ [Pears of New York p.272]. Figured in Pomona Britannica [PB pl.LXXXIII/1812] and Saint-Hilaire [pl.32/1828], the illustration used here. 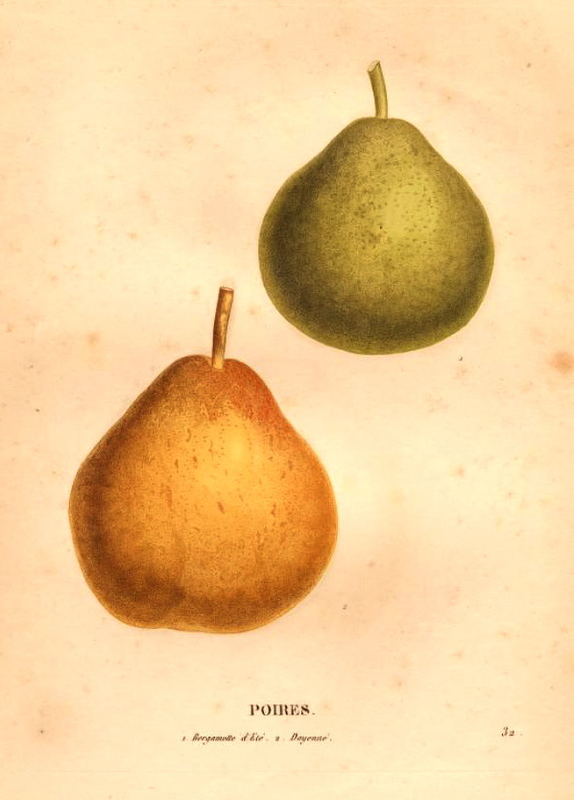 Listed in all published catalogues as ‘Crasanne’ [Pear no.8/1843]. ‘8. Pear (Captain Kent’s) probably Summer Bergamot, formerly miscalled Crasanne. February-March. Not a good bearer formerly but of [4 words undeciphered] does not keep well.’ [Diary B, MP A2951/1862]. Macarthur appears to have changed his mind again as Gansell’s Bergamot is written in pencil. Macarthur’s ‘Crasanne’ is identified as ‘Summer Bergamot’ here and included with Pear no.45, called ‘Beurré Summer Bergamot’ in the catalogues. ‘Gansell’s Bergamot’ appears elsewhere. This pear appears to have been obtained from Captain Kent. I don’t know who Captain Kent was. In a copy of the 1857 catalogue Macarthur kept for this purpose ‘Crasanne’ is crossed out and ‘Beurré ? Captn Kent’ substituted. ‘Beurré Summer Bergamot’ also appears in an Addendum to the 1857 catalogue [Pear no.45/1850]. In a copy of the 1857 catalogue the number ‘45’ is changed to ‘36’. Elsewhere such changes were made to align with the diary numbering but there is no diary entry for this pear. Obtained from Veitch’s Nursery, probably the original Exeter premises. Pear Summer Bergamot | Saint-Hilaire pl.32/1828 | BHL. Summer Bergamot is the green pear at the top.